Two weeks ago we reviewed the new album by Sting Mercury Falling remarking on the rarity of performers who achieve multi-platinum superstardom and then use that built-in popularity to take his or her audience to new musical directions while still managing to sell records. The Beatles were probably the first genuine rock stars to devote themselves to exploring interesting new musical directions without losing their fans. These days, Sting is one of the few performers fortunate to be in that situation. But almost simultaneously another English rock star with a penchant for a high level of musicianship and eclecticism has released a CD that shows no artistic compromise and yet is likely also to do well among the millions of people who have bought his band's previous records. 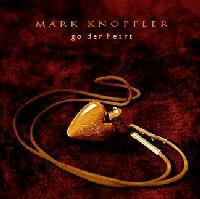 It's the new solo album by Dire Straits founder and composer Mark Knopfler, entitled Golden Heart. Dire Straits emerged two decades ago with their debut album that yielded the offbeat hit Sultans of Swing. Since then the group has build a large following. According to their record company, the band has sold 85 million albums worldwide over the years with a series of releases that not only became classic rock hits of the 1970s and Eighties, but also uniformly won critical praise for high quality writing and first-rate musicianship, and on later albums, excellent sonic standards. The group also toured tirelessly and developed a great reputation for their shows. Over the years, Dire Straits' personnel gradually changed until on their last album From Every Street, released in 1991, Knopfler and bassist John Illsley were the only original members. Meanwhile, Knopfler remained ambitious, taking on outside projects like creating music for several films, starting with "Local Hero" 14 years ago. Some of that film music was compiled in a set released in 1993. Knopfler has also done some interesting and seemingly unlikely collaborations such as a set of joint albums with Nashville guitar legend Chet Atkins, and recently appearing with the Irish traditional group The Chieftains on their album from last year The Long Black Veil. Over the last two years, Knopfler has been working on this solo album at what he describes as an unhurried pace, getting together with some of his musical acquaintances in Nashville, Dublin and New Orleans for this new recording that is a nice composite of his recent influences, with Celtic, country and Cajun being added to the trademark Knopfler sound of his gruff vocals and articulate rock guitar work. The result is a generous 70-minute CD that is quite recognizable as the work of the leader of Dire Straits, but also explores new areas fans of the band who hadn't been following Knopfler's side projects, might not have heard previously. Among the guests on this CD are Sean Keane and Derek Bell of the Chieftains, Irish singer-songwriter Paul Brady who is mainly heard on whistle, plus another traditional Irish musician Donal Lunney who plays some bouzouki. From the Nashville sessions are heard Matt Rollings, a fine keyboard player who has been part of Lyle Lovett's recent albums, and pedal steel guitar player Paul Franklin. Ubiquitous Nashville session piano man Hargus "Pig" Robbins is also heard on a track. Also heard frequently on keyboards is studio ace Steve Nathan. Doing background vocals is country star Vince Gill, who interestingly appeared on the last Dire Straits album. And from Golden Heart's Louisiana sessions come Cajun musicians Michael Doucet of Beausoleil, and Jo-El Sonnier, along with guitarist Sonny Landreth. One of the members of the latter-day Dire Straits, keyboard man Guy Fletcher, is heard mainly doing background vocals, while the most frequently heard player other than Knopfler is guitarist Richard Bennett who provides a tasteful counterpoint to Knopfler's instantly recognizable sound on clean and fuzz electric guitar and on the Dobro Knopfler has used from time to time with Dire Straits. Knopfler's writing style, though eclectic this time around, retains its familiar traits and its rock & roll sensibility. As on much of Dire Straits' music, the lyrics are often impressionistic, though Knopfler also can address himself to topics on his mind such as materialism. But in keeping with the occasionally traditional folk influences, there are also lyrics that sound like very old songs. Mark Knopfler's new solo album Golden Heart, which is actually his first non-film related recording away from Dire Straits, is a fine work that carries on Knopfler's trademark sound, but also encompasses the various influences of musicians with whom he has collaborated on his various recent side projects. It's an interesting mixture of traditional Irish, Nashville, Cajun, plus lots of Knopfler's sophisticated brand of rock. The composer's voice is an acquired taste, and sometimes he has trouble rising to the demands of the musical influences, but he handles most of it well and by now is certainly a familiar voice on the music scene. His guitar work, also a trademark, is particularly fine, in all three of his sounds -- the clear, ringing electric sound, the fuzzy lead guitar made famous in Dire Straits' Money for Nothing, and his understated acoustic guitar and Dobro. He is joined by an impressive gathering of highly respected musicians in each of the recording venues -- Dublin, Nashville, Louisiana and also back home in London. What it all adds up to is an album sure to please fans of Dire Straits, while providing a stimulating journey through Knopfler's own musical interests. Like the latter Dire Straits albums, Golden Heart is marked by excellent sonic clarity and an artful mix that balances a kind of atmospheric quality with immediacy, even though the engineering and mixing team are different this time. One can hear a certain amount of compression in the sound, but that seems almost inevitable these days on CDs released by the major record companies who seem to be worried that their records might not be as loud as the competition's. But Golden Heart is still a treat on a good stereo system. After twenty years on and off with Dire Straits, Mark Knopfler's first real solo album is another of those rare examples of a rock star challenging his audience with worthwhile music that on the strength of his popularity is likely to sell well, and perhaps bring a little quality music to the pop charts. (c) Copyright 1995 George D. Graham. All rights reseved.